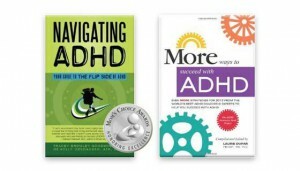 An excerpt from Navigating ADHD: Your Guide to the Flip Side | Navigating ADHD Inc. Struggling with poor social skills is yet one more challenge faced by children with ADHD. The traits that make it difficult for children to follow along in school also present a struggle in normal everyday social interactions. No one is born with good social skills. Rather, they’re learned during early childhood through watching and copying others, practice, and positive reinforcement by adults and peers. Children with ADHD may pick up bits and pieces of what is appropriate but, due to their inattention, impulsivity, or restlessness, they miss the general picture of what positive social skills look like. The good news is that it’s never too late to teach social skills. While they may have missed some of life’s natural lessons as a young child, children with ADHD can benefit from concrete examples, practice and, of course, lots of encouragement. The best way to teach your child positive social skills is to determine the areas in which he’s lacking and to give them extra attention. Stay tuned to read our upcoming book: Navigating ADHD: Your Guide to the Flip Side of ADHD for tips and strategies on helping your child overcome social skills struggles. Or…….join us for our workshop “Building Social Skills” on October 20, 2010.